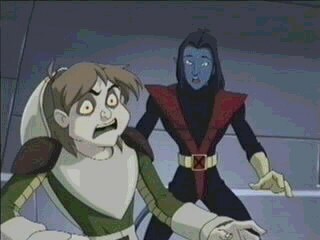 This page is respectively devoted to Evolution's two most wonderful yet under rated characters...Nightcrawler and the Toad. I'm trying to get this site bigger, but I can't do it alone. Add ons and suggestions are greatly appreciated. New Episode guide page added. I have no idea what happened to the old one, or where I might have stuck it, but this new one has more nifty info. Check it out! ..Oh yea, Sign my guest book! New Multimedia page added. Check it out for some nifty theme songs, and Ep. clips...Oh yea, Sign my Guestbook!!! Okie dokies, so far I still haven't the time to update my photos for the picture page yet, but give me time they will be there. So far I've gotten 65 hits to this site, thats pretty good for the short time its been up, so Come on guys start signing the guestbook, i'd love to hear from you! About the only updates i have, are the Top 10 Evolution site's banner, the image isn't working but now the link is, either one or the other *sigh*, and new fanfics on the fan page, greatfully sent in by Todd Fan *applauds* read em' they are spiffy-tacular! I've updated a new page. There is now an episode's list, many thanks to Extreme Evolution. Also there is a link to join a yahoo Evolution RP group on the Home page. Check it out if you like to roleplay. Well it's here my plans and ideas are actually up on the web now. I'm seriously hoping for this project to go far, and for it not bomb like all my other pages. Granted this page is far from finished, but i'm hoping for that to be only a minor hurdle. I will update more soon, til then, look around, and contact me! All characters are the property of Marvel and are used without permission and not for profit. Copyright (C) 2002 Extreme Evolution, all rights reserved..